Are you in North Richland Hills, TX. and having car problems? Don't panic, North Richland Hills Mobile Auto Repair can perform right on site, at your vehicle's location. We can service all makes and models: cars, pickups vans, trucks and RV’s. To keep your vehicle in a good condition, you should definitely need to take care of it. So, if you are in North Richland Hills, TX. then North Richland Hills Mobile Auto Repair can reach out to you at any time to take care of your vehicle. North Richland Hills Mobile Auto Repair is a professional towing and mobile auto repair assistance service provider. We are located in North Richland Hills, TX. Our entire team is committed to meeting those needs. We have more than 10 years of experience. The result, a high percentage of our auto repair business is from&nbps; repeat customers and referrals. Car breakdown usually happens when you least expect it. With proper mobile auto repair options, we can save you money and frustration. No matter what you need from&nbps; tune-ups and auto repairs to quick onset problems that put you in a bind. No matter the problem we can handle it. 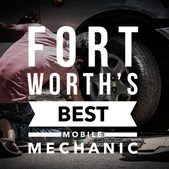 ​North Richland Hills Mobile Mechanic: 682-847-7898 Mobile Mechanic North Richland Hills, TX.